In a marathon ballgame that lasted 19 innings, the Oakland Athletics beat the Los Angeles Angels 10-8 early this morning, leaving fans and players happy but exhausted. The game began at the Oakland Coliseum shortly after 7 p.m. and ended at 1:41 a.m. after first baseman Bandon Moss hit a two-run homerun in the bottom of the 19th inning. Team officials called the six-and-a-half-hour game the longest ever played in Oakland A's history. They used the time as a ticket deal for Tuesday's game. The team announced on its official Twitter feed that from noon to 2 p.m., certain tickets for tonight's 7:05 p.m. game against the Angels at the Coliseum will cost $6.32. The tickets covered in the deal are in the Plaza Outfield section. For those in attendance, the extra innings presented some tough choices, such as whether to catch the last BART train home. BART spokeswoman Alicia Trost said a Coliseum announcer called out the last train times at midnight to make sure fans knew when to head to the station. "We have a set schedule and stick to that schedule," Trost said. As usual, there were extra trains in service to accommodate baseball fans heading to and from the game, but Trost said the tracks can't stay open late. The last train left the Coliseum station at about 1 a.m. Longtime A's fan and sports blogger Rhamesis Muncada kept tabs on the game through Twitter and on his site newballpark.org after deciding not to go to the Coliseum to watch it live. The San Jose resident said he started listening on the radio and then switched to TV, "and then it went on interminably for the rest of the night." He said he has been to other A's games that have been drawn out -- usually because of weather delays -- but that this game was in a league of its own. "This was just a plain-old long game," Muncada said. He noted that the crowds started to dwindle after about five hours. "It's all people who feel very invested in the outcome," he said. He spoke to some baseball friends this morning who had attended the game, and described them as being "in a daze" and suffering at work. As for the players themselves, Muncada said the effect of the extra hours was noticeable with both teams. "You can definitely see the players' performance degrading," he said. They will have a brief break today before being called back to the field for tonight's game. 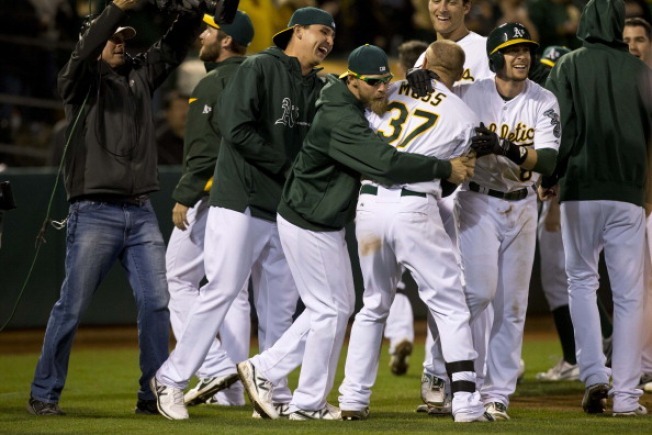 Many fans commented about the game on social media, including one Facebook user who wrote, "I woke up past 1 a.m. and the Athletics won in 19 (innings), wow, hope no kids had school the next day, or people had to work." Another Facebook poster was shocked that fans stuck it out. "The ball park bars stopped serving beer 11 innings ago! Six hours of baseball and no booze?! Those guys deserve a medal," the post read. The A's will face off the Angels tonight at 7:05 p.m. at the Coliseum.